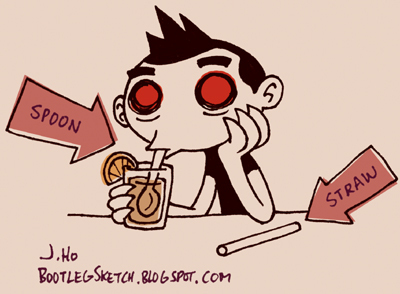 I guess if I’m trying to use the back end of a spoon as a straw, it must mean I’m pretty tired? 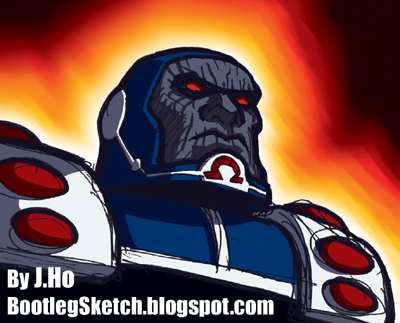 Here’s Darkseid, pretty much as seen in the final Justice League Unlimited episode, “Destroyer.” The Omega insignia on his chin is a tip of the hat to JLA storyline Rock of Ages. This one had been lying around half-colored on my computer for a long time (about 2.5 years), and I finally got around to finishing it up. Pretty basic, but I think it more or less works. I’m away at Comic-Con, so this post was written in the distant past of earlier this week, and visits you, dear reader, thanks to the amazing macro-advancements in hyper-blogtronics provided by the super-intelligent mega-androids of the ever-flowing info-webs. 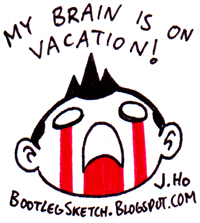 We can only dream what I will come up with as a blog subject when I finally return from my epic Comic-Con odyssey in the far-flung future of just a few days from now. This week, Comic-Con will descend upon us once more. Let us pray that last year’s… incident… will not be repeated. Josh and Vinny signing daily @ Image Comics. Booth 2729. Dustin and Derek, who both have tables in Artist’s Alley. Table FF-04 and Table KK-08, respectively. Karen, Sherri, and Jodi @ the Tired Girl Collective in small press. As mentioned in my previous post, they are also hosting Nathan and his new toy Boris the Raccoon. Even though neither Nathan nor Boris are tired girls. Or are they? Table M07. Yesterday, in a rare excursion into the outside world, I attended the official launch party for Boris at Meltdown Comics. Vinyl Pulse has posted coverage here. Err… I mean coverage of the launch party, not of my attendence thereof. 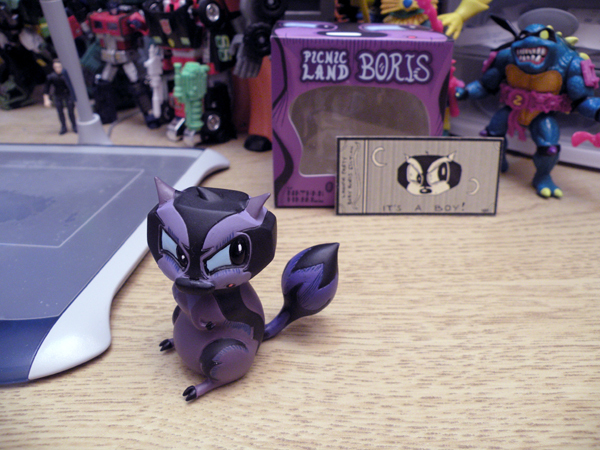 Here’s a picture of the Boris that I purchased, now integrated into my menagerie of desktop toys! Boris is created by Nathan Hamill, sculpted by David Kawano, and produced by U1 Toy Arts. He’s available for purchase at the U1 Toy Arts website, and will be sold at Comic-Con at the Tired Girl Collective table in small press (Table M07). More Comic-Con plugs in my next post. Um… yeah, this pose is a little very boring. And I messed up the eyes–so those were re-done in Photoshop. However, I am having fun figuring out how to mix the colors I want. Nothing further, your honor! Guess what kind of suit that is. Go on. Now that’s more like it. Not great by any means, but I feel like this piece has got a little more substance to it. 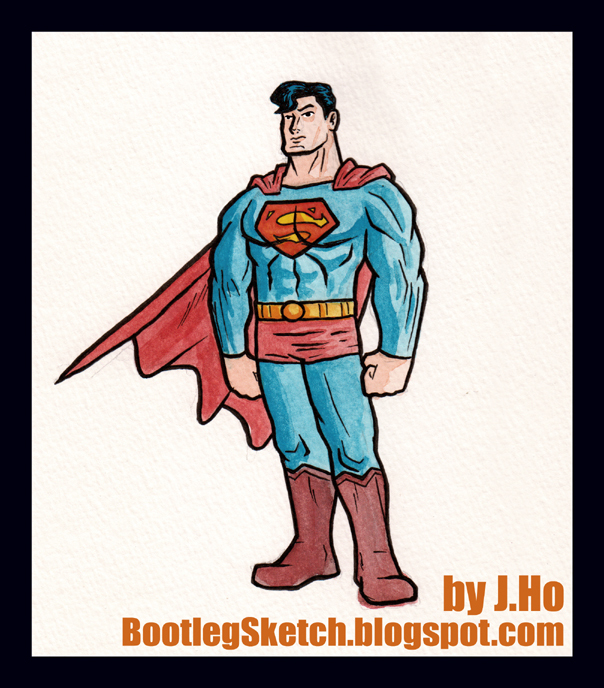 Sketched lightly in pencil, colored with watercolor crayon, and inked over with a Sakura Micron (the signature was written with a Sakura brush pen). I wasn’t crazy about how the thick line turned out on the previous piece, so I decided to use a thin line over the colors–a technique often utilized by someone who actually knows what he’s doing. 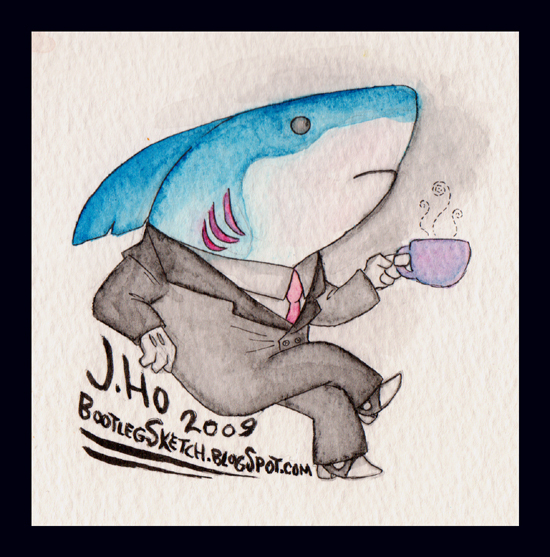 If I could change one thing on this one, I would have blended some blue into the suit to unify the whole color scheme. These past two have been an interesting exercise… relaxing too, in their own way. Hopefully I’ll be able to fit a few more of these in. Hello there goldfish-rendered-by-me, what do you think of the quality at which you were rendered? Junk! 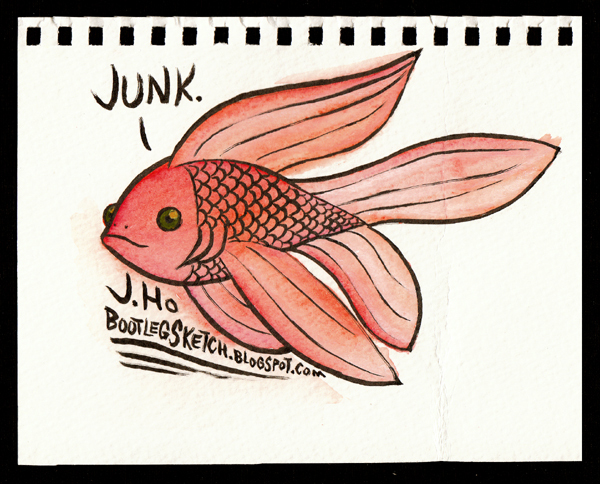 Junk, you say? Yeah pretty much. I felt the urge to experiment with watercolors this past weekend, but all I had were watercolor crayons, and this is what I came up with. First of all, watercolor crayons are, in my opinion, big time cheating. The reason watercolor is tough, is because you have to be able to control/predict the flow of it–but at the same time, you have to go with the flow (literally). At least, this is my understanding of the matter. With watercolor crayons, you just put the color where you want it, and blend it with a wet brush–it takes some control, but not like real watercolor. This piece was very lightly sketched in pencil (basically I just indicated its silhouette), colored with watercolor crayon, and the black lines were laid down afterwards, with a Sakura brush pen. 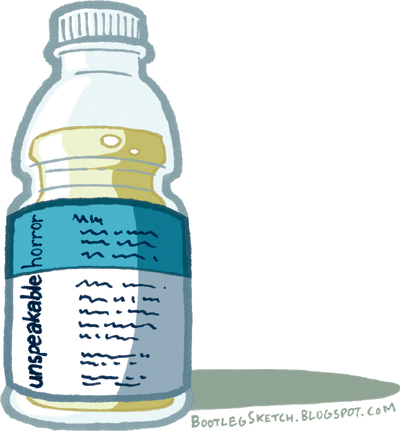 Clearly, it was rendered without looking at reference of any kind. I’m just practicing, so I did this piece on a scrap of Strathmore watercolor paper–and you can see a vertical crease that goes through the tail. I enjoy these experimentations, even though the results are sometimes less than spectacular. 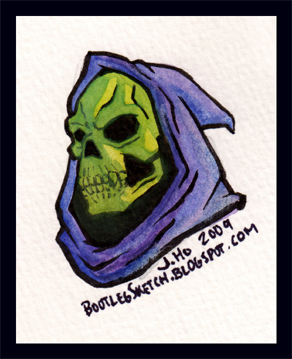 I’ll post watercolor crayon experiment #2 on Friday, which turned out a bit better, in my opinion.